The HomePod is Apple's answer to 'smart speakers', featuring a single point sound source imbued with a digital assistant. Not only a speaker to sound good, but to turn on your lights, the AC and lock your doors. Smart! The HomePod's engineering was beset with problems so the roll out was hinted at, then penned in, then delayed. Finally, shipping only to the US, UK and Australia last month for $349. No date when other countries in the Apple universe will see a shipping date. Since the only 'native' streaming service is Apple Music (the fairly popular, but hifi-inhibited subscription service), the cynical among us should condemn Apple and its walled garden. Even SONOS, the HomePod's natural competitor, now ships with Amazon's (much better) Alexa assistant (HomePod is crippled in the here and now with a deeply repressed Siri). SONOS also allows streaming from umpteen musical services, including social media's mandatory Spotify and the only service worth a damn sound wise, Tidal HiFi. Front-rank technology sites like The Verge, CNET and Engadget went gaga for the HomePod, all spouting its 'audiophile' cred. For the positive Yin, however, there's always the Apple hater's Yang, and they were in full force on YouTube, blasting the HomePod's look, technical inhibitions and sound. There are lots of YouTube videos comparing the sound of the HomePod with the SONOS Play:1 and Play:3 (including a cringe-worthy one with an ‘audiophile expert’ who seems aghast at being cornered into talking about the HomePod's sound). Also comparisons versus the latest Alexa Echo and the Google Home Max (Business Insider called this artless large plastic lump ‘high end’). Even listening to the YouTube videos with good headphones, the sound was fairly similar from all the major players, at least via the auto tuned, Top 40 crap that everybody used for a demo. Sure, the demos are fun, but just as the recent and similar Stereophile videos are fun, but equally useless as an auditioning tool, you really need to hear the source in your room/home. So, in the interests of Apple fanboys like me everywhere, I purchased one through US friends—following are the results. If you want to find out more about the technology and what Siri can (or cannot do), please check out Apple's page. This is a sound review. An audiophile's review. The Apple-hyped technology re the HomePod’s seven tweeter array and upfiring woofer talks of nothing else but great sound and the tech jiggery pokery from its powerful A8 chip. Basically, the chip equalizes the sound so octaves remain in balance and wall reflections are ameliorated. After setup (super fast and convenient, but only with an Apple device, BTW), I placed the heavy pod on my living room sideboard. And it stayed there for the duration. Since Tidal HiFi can only be played via AirPlay (no Bluetooth or audio out, either), I used the native Apple Music as source. When AirPlay 2 arrives, things may get better and you should be able to purchase another HomePod to setup (like SONOS' Play:1s) as a stereo pair. Now, AirPlay's latency makes listening to another (better) streaming service a hassle. A stereo pair? Forget it. The HomePod was happy on my IKEA Stockholm sideboard. A SONOS Play:1 looks on bashfully. Comparing the very refined, and cool looking HomePod to an audiophile product is ridiculous. Fake news! Even when I reviewed the full SONOS system in my main living room, I reviewed it as a 'lifestyle' product. A fully blown, stereo pair Devialet Phantom system was reviewed in the same manner. Same as two SONOS Play:1s paired as stereo. All were considerably better than the HomePod. I'm not suggesting that a meagre system cannot over achieve, in fact, many do. You can buy a pair of Elac Debut B5 speakers for the same price as a HomePod and touch the audiophile stars. It's the arrogant suggestion that a mono source, no matter the ear bending technology or an enclosure the size of a double roll of Charmin, can trick Einstein's and Newton's theories that bothers me. The HomePod can’t. What it does is provide the most luxurious sonic wallpaper with some tricks up its sleeve such as providing information, volume control, and controlling devices attached to Apple's HomeKit (Nest, Philips Vue, etc). This luxury paid dividends on solo piano music and electronic music. Alfred Brendel's Schumann Piano Concerto sounded rich and full, with no distortion when played very loudly. Inner lines were obscured but the piano tone rang out quite beautifully. The HomePod has a refined sound that doesn't implode as it gets louder. It was fun to tell Siri, 'Hey Siri, volume at 80%'. She complied even through the loudest passages due to the well placed microphones. 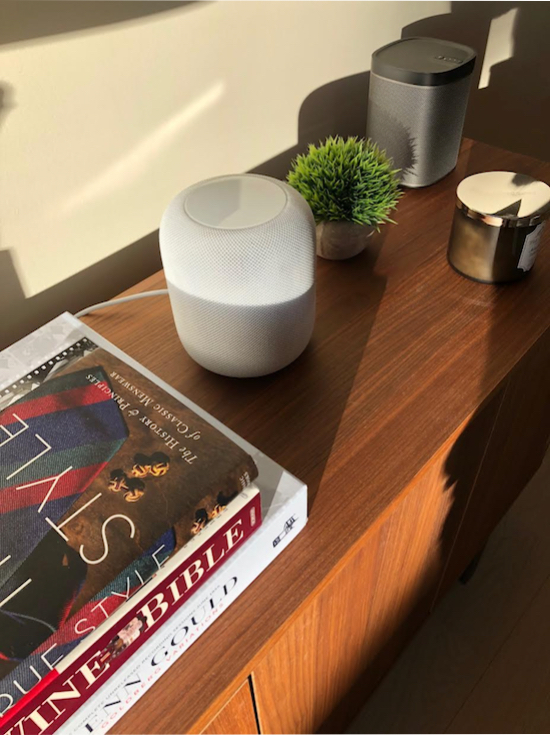 As a reference for one speaker music and their sounds, the HomePod kills the Google Mini, is much better than the Google Home, is on par with the Google Max, and is better than a single SONOS Play:1 or Play:3. However, the (more expensive) SONOS Play:5 has better bass and the Devialet space pod has far better definition and stunning bass for what it is. Add another SONOS Play:1 to the mix. Better. Add a SONOS SUB to the two Play:1s. Infinitely better. See where we're going? Single point audio sources are for background listening. Just as in depth reviews have gone from a sometimes blabby 10,000 words to 1,000, the same can be said for music listening in the day of Trump. Earbuds, the auto tune, non concave melodies and very limited musical talent have stolen the day. But, there is sunlight. You can still get into audiophile territory for much less than you think. You gotta want it and you gotta search. Work for it. What a concept. If you are one of those people, the HomePod is not for you. However, If you are a millennial in the mood for some Electronica flooding through the house (it goes to 11) with no apparent point source or grandparents downsizing to a condo and not bothered about timbre, soundstage or imaging, then pony up the dough. Your musical chariot awaits.